Yes, before you ask, as is contractually required by any and all bloggers I will be talking about the unlikely Jeremy Lin. Now, I know we touched on this yesterday but our goal today is different. My take will be different. You see rather than waxing poetic about the unbelievable and unpredictable nature of basketball or focusing on how no one could have seen this coming, I’m going to focus on how we kind of did. Because when faced with a supposedly unsolvable problem, we brought the science and science once again beat the experts. The problem I’m alluding to is evaluating talent in the NBA draft. Anyone who knows me knows I love to write about the draft. For those who don’t, hello you must be new here. Just in case, let me illustrate that by throwing some links up for your viewing pleasure. Talent is always available in late in the first round. The trick is finding it with some accuracy (which I postulate we can do). Given that the identification is risky a later,cheaper pick is better. This lead to a lengthy draft strategy segment in my guide to running an NBA franchise (Build me a winner rev.2). The key takeaway was that talent was that I needed to build an effective draft model to predict player performance based on publicly available data. I built two (go here for the model build parts 1 & part 2 ). In very general terms the models use the available data to predict future performance for each player coming into the draft from college. Based on that prediction a ranking is done and a draft recommendation is generated. Now this model is a work in process, I build it then publish it then go back at some future point to review to see if it worked. I will make corrections as needed over time. One of the key ideas is having a public build to allow for peer review and answer the skeptics. For the purposes of this discussion for example I will focus on the last 2010 build (see here) because at the request of some of our loyal readers I had included the best undrafted rookies. Can you guess who was number one? Do you want to answer for the class? Mr. Lin actually was the number tenth overall ranked prospect on our draft board and easily the best undrafted. The model had him slightly below the draft treshold. Given this and a few other similar data points, I moved the treshold slightly down to .090 WP48 for Model #1 and .060 WP48 for model #2. You will see the results of that in the numbers that follow. Why should you care exactly? That’s every drafted player coming from the NCAA’s from 1995 thru 2010 who’s played at least 400 minutes in the NBA (2010 shows additional players who haven’t played those minutes yet). It shows the player’s draft year, where he was picked, the model predictions and the player actuals for his first 4 years and his career. For 2010 for example, we can see both the Knicks starting guards in the top 10 but this could simply be coincidence. Did the models actually do anything? A simple test is to look at correlation between the place the player was picked, where the models suggested picking him and actual rank by draft in terms of production. Draft order vs production shows minimal correlation with an R-square of about 5%. It jumps to 25% for the predicted production rank. The models perform as well or better than the majority of lottery picks. The only real difference is superstar talent at the number one pick (which isn’t really an every year affair). So to review, using publicly available data we built a model that picks draft winners at a 75% rate which is better in general than having the #1 pick in the draft and big winners at a 40% rate which is better than everything but the #1 pick. P.S. How about one more bonus table? 21 Responses to "Jeremy Lin and the Ghost of NBA Drafts Past"
How is it that your model would leave WoW superstar, Marcus Camby out in the cold? Surely that must keep you up at night? Heh,Him, David Lee, Pierce and Nash are the ones that keep me up looking for answers. Beasley (and to a lesser extent Carmelo) are the ones that are really interesting. Model loved them coming out of college. I have a theory, based on AI, that a poor shot selection isn’t an issue until players get to the NBA, and the 7’ers/longer NBA players expose this at the rim. Maybe Beas and Melo suffer that, or is it college 4 moving to NBA 3? A question I have: players can improve, but their projection is based on what they did, without necessarily what they need to, or can, improve. For example Suns player Dudley is a .046 but has hit .139 in his career, in part because he developed a 3 point shot. Another ex-Sun, Alando Tucker, who looked like a much more athletic player, never developed a 3 point shot and subsequently was gone quickly. Is there some way to know what is lacking in a player? For example a poor/non-existent 3 point shot for a college 4 moving to the three is possibly rectifiable, but a poor rebounding 5 probably isn’t salvageable. In the next iteration, would there be a way to find players that are lacking skills that are fixable, but who are otherwise talented enough? Spurs from 2008 on is notable. Up until then, they mainly went European(Udrih, Mahinmi, Splitter) or traded picks for Cap space. Since then, Selected George Hill(best available in this model), DeJuan Blair(Best available in history of model), James Anderson(2nd best available) and Kawhi Leonard(2nd best, but certainly understandable with Blair, Splitter, Bonner as Bigs and Jefferson at SF). I would guess that the Spurs have a similar statistical model in place, as this matches their choices so closely. I share in your conclusions actually. The Spurs are very smart about this sort of thing and the alignment is a little too close for coincidence. Faried would have been redundant for them. Leonard was the clear best available player for their needs. Except AI and Wall show up as the two worst prospective picks at #1. The model is built with a purposeful skew towards the immediate future. A draft pick entitles you to a four year commitment so I tried to focus on that. Let’s not get ahead of ourselves here. You’re determining both “draft winners” and “good players to be drafted” by the WP48 metric, which emphasizes different things than, say, PER or WS. Of course someone who’s, for instance, good at rebounding but has low PPG in college, thus being better at WP48 than other metrics, is more likely to have a decent WP48 in the pros. However, the exact same thing can be said of PER! “Our PER model for draftees is better at predicting who has a better PER in the pros” is exactly analogous to the message of this, yet you guys would ridicule that! 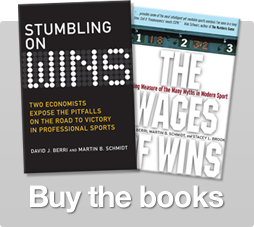 We use Wins Produced because it correlates to wins and is fairly stable year to year. In short that is a good goal to measure against. We would not mock a PER model if PER was actually useful as a production measure. Now if a model was in place to draft players with high future trade value then PER might not be terrible. However, Arturo made the great point when I discussed this with him that the good manager should go for the player that will impact your franchise as hoping for trading in 2-4 years is not a great bet. Should you pay more for current earnings (current basketball productivity) or prospective earnings (basketball potential)? The answer depends on how much more you are paying (how much higher you are drafting the prospect than the current productivity warrants), how high the potential is, and how certain you are he will achieve that potential.